Thanks to everyone who weighed in and voted on the Pinwheel Sweater and left comments. It was very interesting to read the wide variety of opinions. Some of you said you thought it looked great on me, some of you said you thought it looked awful. I guess what it boils down to is that beauty is in the eye of the beholder, huh? Before I posted yesterday, I had decided to knit on. 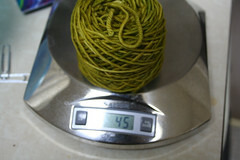 The first sleeve took about 150 grams, so I knew I’d run out. But last night I knit until I ran out of yarn, and, predictably, got about one-third of the second sleeve done. Much better I think. The sleeve really helps. So much so, that I think I’ll be able to wear it without a pin holding it together. The lack of sleeves made the sweater want to slide off my shoulders, and I do have narrow shoulders, which did not help things. Lucy does not get all the hoopla over a sweater. I’m glad you stuck with it—your edging is lovely and I couldn’t have brought myself to frog it for you! Oh I definitely like it better with the sleeve on. I would definitely mark it as a keeper. The sweater looks very pretty in the new picture. The edging really gives it a feminine lacy look. The sleeve looks gorgeous and the lace edging sets it off so nicely. When will you receive your extra yarn? Will there be a dyelot issue? It looks so elegant, I can see you pulling on for extra warmth in your typically cold office. I stand corrected. It’s amazing what a sleeve can do! Much better. I love the sweater!!! You must be going nuts waiting for the yarn to come now that you are ready for it. I wonder if anyone out there has a skein of it they would be willing to trade for something or for the skein that you will get eventually. Just a thought. I was a nay sayer, but it is very nice with the addition of a sleeve. I’m glad you persevered. You are an amazing knitter. Boy am I glad the sleeve helped, woulda hated to see that gorgeous sweater frogged, esp after all the work you put into it. I just responded to the vote from yesterday before realizing that you already posted today. Glad it’s a keeper. It’s really beautiful, very elegant. 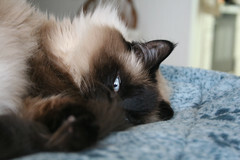 Oh Lucy, we know you felines don’t get what your Mom & her readers are always fussing about. But our knitting decisions are very important to us … just as important as were you guys will find your next comfortable napping spot. The sleeve with the edging is pretty–as in the original pattern photos. I’d like to see a full front photo–which will have to wait until you get more yarn, I suppose. To me, the front still looks kind of frumpy, although that is the fault of the design, not your knitting! I didn’t like it when you had it pinned, but unpinned it looks great. It’s amazing the difference such a small thing can make. Honestly, I was in the “frog it” camp yesterday but I’m glad you stuck with it. The sleeves really do make it look especially lovely! Yay! I’m so glad you kept it. It’s so beautiful and is so flattering to you. 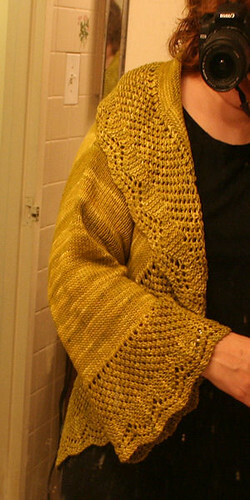 I can’t wait to see the entire sweater finished and pictured as you will wear it. I knew it would turn out fine. The sleeve length is just right! And I think you’ll be able to wear it with a smart outfit too. Congrats! love it love it love it I think it is lovely! Lucy has her own sweater that is why she doesn’t care about yours! So glad you didn’t rip it out. The sleeve REALLY helps to make this sweater become a keeper. Wow. That edging looks particularly nice on the sleeve! I’m glad you persevered, though I didn’t presume to advise you; since I couldn’t see it on you in person. It’s a fine line between love and hate, in the words of the Pretenders song (which I just found out Annie Lennox wrote, didn’t know that!). Lucy, staying warm and being petted are the most important things, we all know that! Yay, for the pinwheel! Yay for sleeves! I’m glad you’re keeping it — I agree that it’s lovely, and I just knew seeing a finished sleeve would help. Will you block out the lace on the sleeve so it’s more “holey”? Wow, interesting. I also have slight shoulders, and if the thing will stay up on you … I remain skeptical on the subject of circular sweaters, but this is definitely a persuasive data point in the other direction. Glad to see you pressed on – thought the addition of the sleeves might add the weight the sweater needed! I too am happy you stuck with it and made one sleeve. Makes me want to rescind my “frog it” vote from yesterday. That sleeve turns it into a lovely garment, Wendy. Thanks for preservering and I hope the remaining yarn shows up on your doorstep shortly! That sleeve is just beautiful! But wouldn’t life be easier if we all just wore our “clothes” permanently like Lucy does? LOVE it!!!!!! The sleeve makes all the difference!! Press on!! I didn’t much like it before the sleeve–the shoulders were pretty slumpy. But it does look much better now. I think the sleeve pulls down on the shoulder a bit and gives it shape. I especially love the lace edgings. Beautiful. I love the way the lace looks, especially on the sleeve. I am so glad you are back to knitting sweaters. Although the socks were nice, I really look forward to your sweaters and shawls. Beautiful! A lovely holiday sweater for you. it’s a definite keeper now that i can see it with the sleeves on! I knew sleeves would help. Yes, it looked pretty much like a hot mess without sleeves, but non-traditional sweaters always look strange until they are complete. I about had heart failure when I tried on Lara halfway through (and that one isn’t even that non-traditional) and I looked awful. Finished the other sleeve and, suddenly, I had a gorgeous sweater on my hands! I voted to frog it yesterday, but the sweater looks so different with the sleeve added that I’ve changed my mind. It’s quite striking, and I’m sure it will get many compliments when worn. Wow… what a difference a sleeve makes. it doesn’t have the ‘burrito end’ look that was sort of happening prior to sleevage… very nice! I think the sleeves are an important part of the complete fit! You really will not be able to see the true fit until the garment is completed. It is gorgeous!!! I’ll go along with the general consensus. It’s lovely with the sleeve, and unpinned. The line is graceful and the edging very rich. I like it better than the crocheted original. Lovely lovely lovely. Thanks for the edging pattern. It’s exactly what I need to finish off the Lady Eleanor shawl (from Scarf Style) I made it to long and decided to gently felt it. Which caused the shawl to be to narrow, so needed something along the long edge. Your trim will be perfect as well as a perfect pattern to cut my knitting lace teeth upon. Having four furrbabies… I will have to agree with Lady Lucy. My two youngest are 6 months and 18 months, so knitting is done when they’re having a long nap time. Espically since none are declawed. It looks lovely. And your edging is outstanding. But it would really bug me if it continues to fall off the shoulders. I knit a shrug that does the same thing. Pain. I do think the colour is AWESOME!! I am relieved to see the sleeve has grown. It is very pretty with lace edging ! I think it’s lovely! The lace edging you put together really gives it a lacy, flowing look. I actually printed out the pattern…and if you’re going to make the edging available…hmmm. Lovely lace! I’d say keep it, too…the edging is really scrumptious! I didn’t read blogs over the weekend, so I didn’t get to vote (was knitting tiny socks). But, I know the pitfalls of circular sweaters all too well, having made that Vogue Knitting cover one a couple of years ago. I have to FIRMLY pin it on or it constantly falls off. I think circle sweaters are a better idea than they are a finished product, BUT they are fun to make, and look good while they are actually on you for brief periods of time. I’d have finished it, too. I love the lacy look to the sweater! Will you be doing a charity drive for knitting baskets for Heifer International this year? I love the sweater – the way it falls around the waist is very flattering, and I love the belled sleeves! I think it may have to go on my knitting wishlist. The colorway is really beautiful, but I’m not nuts about the name – Pond Scum – It just seems like such a pejorative name for such a pretty color, as though the dyer didn’t really like green, but decided to dye something green anyway, but gave it a mean name. It’d be like naming yarn ‘snot’ or something. Still, it is very pretty. It looks even better with a sleeve — just think about how good it will look with two! Glad you stuck with it. Can’t wait to see the FO. Yeah for you! I wondered if the weight of the sleeves wouldn’t help get it on. I think it looks amazing! I think the sweater looks great with the sleeve, but in the picture from the previous poll, it looks like it wasn’t long enough horizontally once you put the pin in it. I think it works out without the pin. I love the scallopy look of the edging! Oh, Wendy! It looks even more beautiful with what you’ve done with the sleeve! I don’t know if that is how it was designed (should go check on Ravelry and see maybe, eh?) but I just LOVE it even more now. I would have been in tears had you frogged it — as I said the other day — I would never be able to do that after so much work. I am upset when I have to frog a couple of rows of a sock and cringe when I see that you’ve ripped a whole toe out 🙂 You’re a stronger woman than me! The sleeve looks great! It really changes the look. I am glad that you decided to knit on. I really like it and thinks it looks fabulous on you. I really do. The edging gives it that nice femine look and I think slimming as well. I loved your pinwheel sweater and was inspired to try one! I have been a sock knitter for about 8 years- I doubt that will change- but I need to try my hand at something else. I was really surprised the pattern DL was free from Elann, too. What a nice surprise. I enjoy your blog and seeing how creative you are!